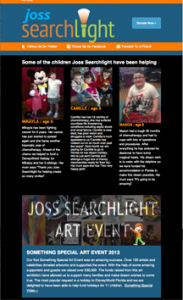 Joss Searchlight (Reg. Charity 1141704) provides practical and emotional co-ordinated support for families of children suffering from cancer. Having a child diagnosed with cancer is one of the most frightening things that your family will experience. You are not alone – approximately 1:285 children will be diagnosed with cancer every year in the U.K. Thankfully most children will get through it and go on to lead normal healthy lives. From the moment a child is diagnosed with Cancer we are there for the family. Whether you need advice, counselling, specialist equipment or simply pointing in the right direction, we are there. Through our ‘It’s Good to Talk’ program we are building a national support network of families who understand what you are going through. We are also producing complementary Support Films, illustrating how other families and children have dealt with childhood cancer. Our helpline can offer advice on NHS Resources, benefits, fund specialist equipment, liase with organisations on your behalf and of course we also endeavour to make your childs’ ‘Wishes Come True’. We produce a newletter two to three times per year. If you would like to receive one please enter your Email address in the box below. We promise not to bombard you with emails and we will not pass your details to any other groups.